Website visitor Eduardo wrote to ask that I scan and post this construction article for the Beechcraft Bonanza Debonair. I am glad to do so for anyone, at no charge, as time permits. Usually, I am able to get requests completed within a couple days. If plans are still available through the AMA Plans Service, then only lower resolution versions are posted (typically 1500 pixels wide) in order to not cheat the AMA out of needed revenue. Besides, there are distortions in the scaled-up magazine version that would not be present in the AMA's reproductions from the originals. The AMA Plans Service will provide a version of the plans at a size different from the original, so, for instance, if you want a 48" wingspan rather than 60" like the one featured. I checked the AMA Plans Service listing and they do not appear to offer these plans, so please end me an e-mail for my full-resolution scan. The plans show a foam wing and a fiberglass cowl, so it will not be an easy build. * WARNING * When I used the scale shown on the plans, it does not jive with component size marked. For instance, the spinner is labeled as 2" diameter, but according to the scale it is only about 1-3/8". It appears that the length of the scale should be labeled as 4" rather than 3" in order for everything to come out correctly. I have never seen this happen before. Maybe the AMA discontinued offer plans because of it - just a thought. True-scale models of Beechcraft's best-known aircraft. Conventional construction and a delight to fly. The first time I saw a Bonanza was during a Sunday excursion to the local airport with my father. I couldn't have been more than five or six years old at the time, but the airplane's distinctive looks left a deep impression. At that time, the Bonanza design was relatively new, having been type-certified in November 1946, and its radical appearance implied that it was an ultra high performance lightplane. Over the past 25 years, the Bonanza has undergone several changes. The most recent model, the V35TC, is a 285-hp turbocharged version of that swift looking, V-tailed aircraft I admired many Sundays ago. The Bonanza line also includes a conventional-tailed model, the E33, which was introduced in the early 1960's under the name of Debonair. Essentially, it is a 225-hp Bonanza with a conventional tail (the horizontal stabilizer was taken from Beechcraft's T-34 Mentor). It looked so attractive I resolved to build a scale model. Generally such an urge passes before I can clear the drawing board and reach for my T-square, and the Bonanza was no exception. I rationalized that I'd rather be flying than building; besides, I didn't have any three-view drawings. Alas, Flying (July 1968) ran a cover picture of a chrome yellow and white E33 with black trim and I could resist no longer. The local Beechcraft dealer was able to supply Bonanza brochures, as well as the address of Beechcraft Marketing Services in Wichita. 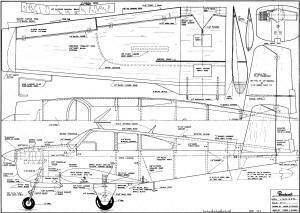 Beechcraft promptly sent drawings of their entire line from the Musketeer to the King Air. Initially, I decided to build the conventional-tail E33 instead of the V35TC because I was leery of stability problems with the V-tail version. 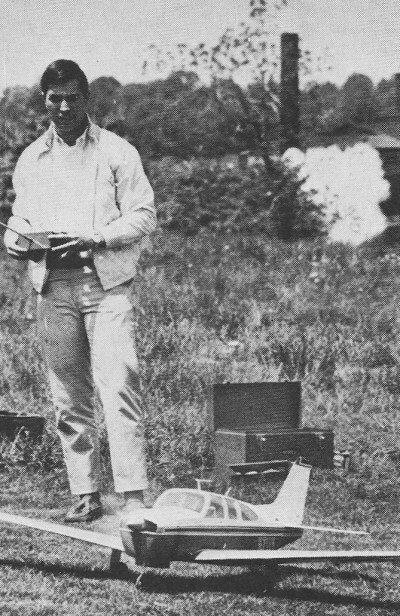 I also elected to incorporate a non-scale flat-bottomed airfoil to lift the model's projected ten pound weight. My fears were unwarranted on all counts. 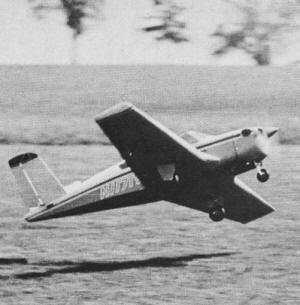 The completed model flew at well under ten pounds; the scale airfoil on my second Bonanza proved to be far more efficient; and the V-tail provides as much stability as any conventional-tailed configuration. The plans show both the V35TC and the E33 versions. The only differences between the two models are in the wingtips, the rear window outline, and the tail. 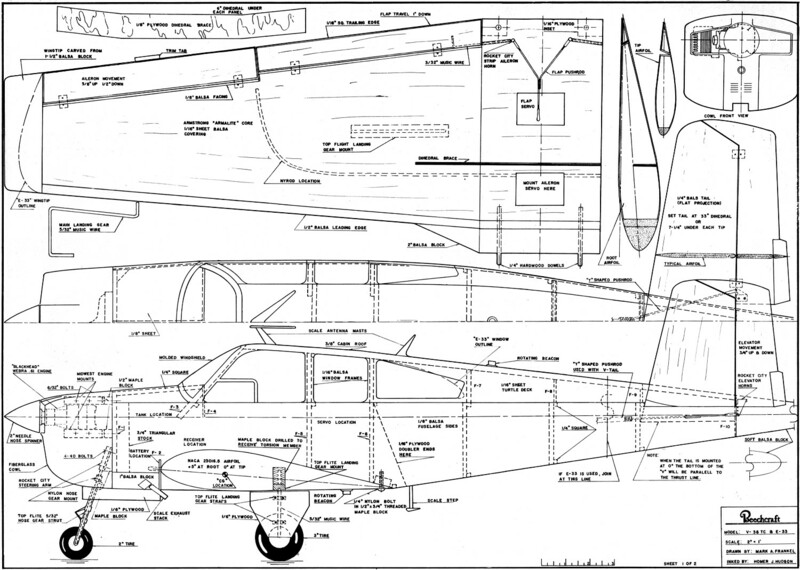 To build the E33, cut that tail projection (shown on the plan's second sheet) and join it to the fuselage side view at the broken line. Ready to taxi out, the Debonair responds to gently advancing throttle. Except for tip shapes, tail surfaces and rear window outlines, the two craft are basically similar. The fuselage is simple to build. Basically it is a box of 1/8" balsa sides with 1/4" sq. cross members. A 3/8" balsa roof is glued to the tops of formers running from F9 to the back of the windshield former. The roof line has a slight curve, making it necessary to score the 3/8" sheet above F5 and F6 to allow its proper seating. 1/16" balsa sheeting fills in the area between F7 and F9. The roof is then carved and sanded to the cross sections shown on the plans. The bottom of the fuselage from the trailing edge of the wing aft is 1/16" sheet. The windows are made from sheet celluloid and are glued in place with a nitrocellulosic glue, such as Ambroid. The windshields on my Bonanzas are also cut from sheet celluloid; however, this won't reproduce the full-size Bonanza's slightly bubbled windshield as shown on the plans. If the bubbled windshield is desired, it can be molded from a male form. (The "Jungster" article, p. 20, Aug. 1969 AAM contains an excellent, explanation of molding.) After the windshield and windows are in place, the 1/16" balsa window frames are glued in the appropriate positions. The cowling is made with fiberglass cloth and Hobbypoxy Formula II over a styrofoam mold. Four layers of a medium weight glass cloth were contact-cemented to the styrofoam form and then coated liberally with Hobbypoxy, After the Hobbypoxy cures, the styrofoam can be melted out with dope thinner. The outside of the cowl is made perfectly smooth by filling the low spots with Epoxylite and sanding with 60 grit paper. The cowl is held to the fuselage by wood screws that are driven into maple blocks attached to the firewall. The tail surfaces are shaped from lightweight 1/4" balsa sheet. If the V-tail version is being built, care must be taken to ensure that the tail is set at 0 degrees incidence. When done properly, the dihedral joint should be perfectly parallel to the thrust line. The leading edge of the V-tail will not rest on the 1/8" sides because of the shape of the fuselage. When the V-tail is glued firmly between F9 and F10, the triangular gap between the 1/8" fuselage sides and the tail is filled with scrap 1/8" balsa. The E33 tail does not pose any alignment problem, since the stabilizer rests directly on the 1/8" sides, thus setting the tail at 0 degrees. The wing is made using an Armalite polystyrene core covered with light 1/16" balsa sheeting. Since the wing is rigged 5 degrees positive at the root and 0 degrees at the tip, a foam wing is probably the easiest and certainly the most accurate means of construction. A built-up wing could be employed if it were built without the wash-out and the wing incidence reduced to 2 degrees or less. I built the original wing without wash-out, but the maiden flight taught me that a wing without this much positive incidence yields the most unexpected and unforgiving snap rolls possible. Taking off in a snappy climbing turn is the V-tailed Bonanza. 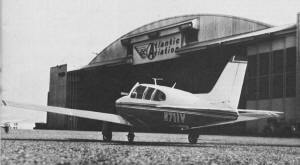 Further research at the local Beechcraft dealer determined that the full-size Bonanza has pronounced wash-out. A new foam wing was cut and the results were quite different. When the wing stalls, it has no tendency to, drop a tip; in fact, the ailerons seem to remain entirely effective throughout the stall. This certainly supports the argument that Dave Platt and others have made: a scale aircraft tends to fly best with the scale airfoil and force arrangement. If one of the newer lightweight radio systems is used, installing a fully detailed interior should be easy. The servos can be hidden under the seats, while the battery and receiver can be placed near the firewall under the fuel tank. The current Bonanza brochure provides some excellent interior shots which are valuable for adding detail to the model. Take care, however, to keep the aircraft's weight at ten pounds or less. 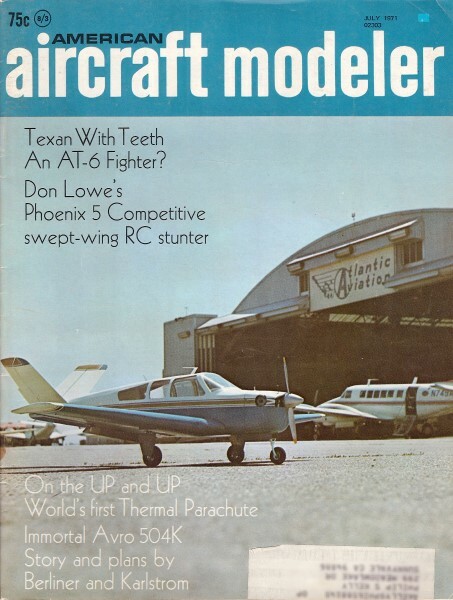 Various general aviation publications as well as local airports are good sources of inspiration for scale color schemes. The colors on my E33 and V35TC were taken from a Beechcraft ad in Flying. I brushed three coats of Kampel's clear dope on all wood surfaces, sanding with 220 grit paper between each coat. Then the model was entirely covered with heavy Silkspan and given two more coats of clear. This was followed by four liberal coats of sanding sealer. At this point, the aircraft should be set aside for a week to allow the sanding sealer ample time to dry. Next, the model should be sanded with 320 wet or dry paper until all high spots and all evidence of wood grain are removed. This is probably the most important step in a good finish and it must be done properly to insure a good base for the color. If any grain or unevenness persists, recoat that area with sanding sealer and re-sand when dry. The color coats were sprayed on, using about 10 percent lacquer retarder to aid the paint flow and prevent any blushing. The color, like the sanding sealer, should be allowed to dry for a week before it is rubbed. If the spray has left any "orange peel," wet sand the surface with 400 grit paper. I used DuPont's 202 orange rubbing compound for the initial polishing and followed this with the fine 606 white compound. By now the airplane should have a mirror-like brilliance and is ready for waxing. Any good automotive wax or Jubille household wax will enhance and protect the finish. The radio system should be installed to give the control surface movement indicated on the plans. I used five servos: throttle, ailerons, flaps, elevators, and steerable nose wheel. The V35TC uses no rudder, while the E33 does. Actually, the elevators act as a rudder when the V-tail is banked since one tail surface becomes vertical. Thus a slight application of up elevator in conjunction with an aileron command will give a beautifully coordinated turn. Test flights should be made off a paved surface if possible; a scale model needs all the speed it can get before lift-off. I have stalled my Bonanza when taking off from a grass field because it ·was unable to build sufficient speed. Use only a slight nudge of back pressure on the stick to get the model airborne; it is always better to run out of runway into the weeds than to force the airplane into the air before it is ready. Either version is highly responsive on all axes. The only difference between flying a scale model such as the Bonanza and a typical pattern aircraft is the scale model's higher stalling speed. The flaps help to compensate for some of the problems associated with a high stall speed. I was skeptical about the effectiveness of flaps on a model until I tried them. With the power reduced to one quarter throttle, lowering the flaps will produce a slight nose down pitch. The ailerons remain completely effective throughout the entire range of flap travel. Power should not be chopped completely until the Bonanza is over the edge of the runway with about ten feet of altitude. A touch of up elevator after the power has been cut will produce a gentle flair that will set the aircraft lightly on its main landing gear. I may install retractable landing gear for additional realism. Several reliable units are on the market now, and my new Webra 61 Blackhead should more than compensate for the added weight. The effort involved in building the Bonanzas has been well worth it. 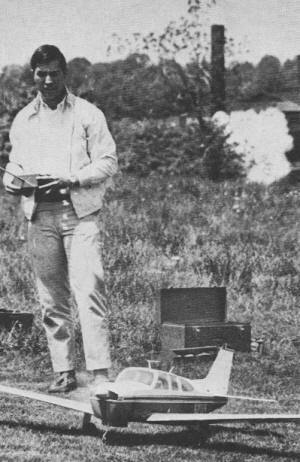 Whenever they are flown, these highly attractive models receive much attention from spectators and modelers alike. Either version builds as easily as a typical pattern model and is twice as much fun to fly.